Just south of the U.S. Capitol, this vibrant neighborhood on the Anacostia River is home to Major League Baseball’s Washington Nationals, watery diversions like kayaking and a booming restaurant scene. 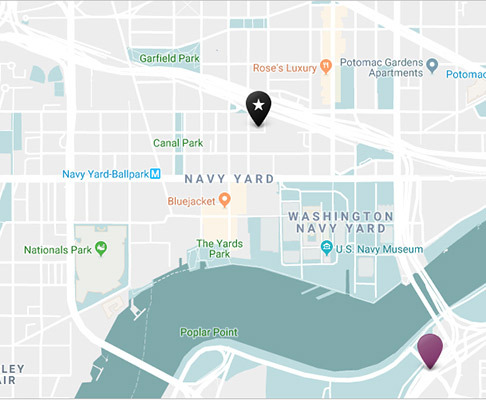 From the late 19th century through World War II, the riverside blocks south of the U.S. Capitol were home to the industrial Washington Navy Yard, an area that has been reborn as a haven for sports fans, nature lovers and foodies. It’s a particularly sweet spot to visit in warmer months with recreational opportunities from paddle to park. Pay homage to the naval history at the U.S. Navy Museum. The Washington Nationals attract a passionate Major League Baseball fan base, and their ballpark features jaw-dropping views of the U.S. Capitol dome from many of its more than 40,000 seats. Adjacent to Nationals Park, the open-air Bullpen hosts bands, food trucks and beer sellers pre- and post-game. Audi Field, home to Major League Soccer's D.C. United, can also be found nearby. The state-of-the-art urban facility will host a variety of sporting and cultural events, community activities and concerts. Riverfront parks and green spaces take advantage of the area’s natural beauty. The Yards Park encompasses a series of mod outdoor rooms, a dramatic bridge and water features for all to enjoy. This park is an ideal place for recreation, special events and festivals throughout the year, including a free concert series on summer Friday nights. You’ll find more water features, a restaurant and a seasonal ice rink at nearby Canal Park, which also plays host to a farmers' market and free outdoor summer movie series. In recent years, the dining scene has blossomed along with the rest of the ‘hood, with hot spots ranging from Bluejacket for house-made beer and The Salt Line for locally-sourced seafood, to District Winery for waterfront views paired with vino and upmarket Osteria Morini, which focuses on Northern Italian specialties in rustic-modern surrounds. If it's coffee or sweets you crave, treat yourself to scoops from Ice Cream Jubilee or eclectic pours from Slipstream. Outdoor recreation shines in the Capitol Riverfront with the high-flying Trapeze School NY/Washington, DC, where you can literally learn circus tricks, and waterfront outfitter Ballpark Boathouse, which offer kayak and standup paddleboard rentals complemented by views of the river's wildlife. The always-rotating creative flavors at Ice Cream Jubilee, Greg Engert's forward-thinking Bluejacket Brewery, cheering on the Washington Nationals and D.C. United. Simply use Metrorail and get off at the Navy Yard-Ballpark stop on the Green Line. You can also use Capital Bikeshare, which has docks situated throughout the neighborhood. The Capitol Riverfront is the place to be for Nationals games and picnics on summer days. It’s also where you can get some of the best food in DC. Discover what’s happening in this happening neighborhood along the Anacostia River.